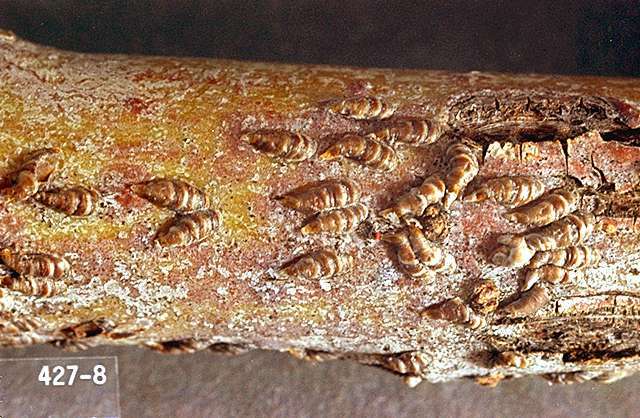 Pest description and damage The mature oystershell scale is approximately 0.13 inch long, hard-shelled, brownish or gray in color, and usually elongated and slightly curved like an oyster or mussel shell. Oystershell scale are found on trunks, branches, and twigs of many broad-leaved deciduous plants. They occur less frequently on the leaves and other plant parts like fruit and seed pods. Scale infestations often are initially limited to isolated colonies on single branches or twigs. Newly emerged crawlers look like minute, bright white pimples on the bark. Biology and life history Oystershell scale overwinters in the egg stage beneath the scale cover and doesn't hatch until late June in the Puget Sound area. The new crawlers are white and only crawl about for a few hours before settling in place and beginning to build the shell. Initially, the scale cover is a loose lattice of white wax that remains vulnerable to any pesticide applications until late summer when it forms a more solid scale covering. Once the scale covering is in place they are less vulnerable to pesticides but still vulnerable to predators and parasitoids. Pest monitoring Use double stick tape to trap crawlers or inspect around infestations for the bright white crawlers in mid to late June. New scale have a fresh pinkish look to them, while old dead scale become gray. Since the waxy scale remains after scale insects have died, it is important to sample the patches of scale to determine if this is a live infestation or if the scale has been controlled by natural enemies. For small infestations, scrape away the scale with fingernail or stiff brush. Hang a bird feeder in the tree to attract insectivorous birds to the area. 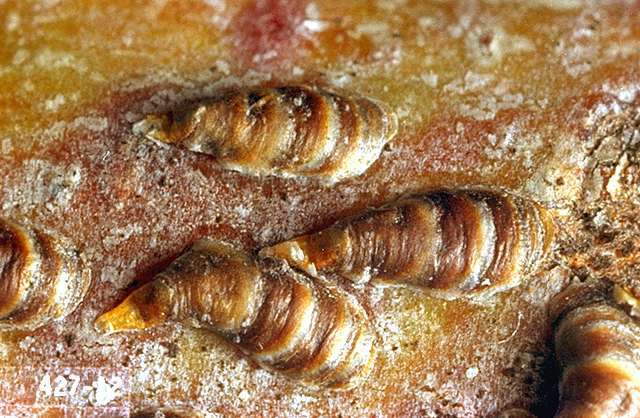 Oystershell scale are preyed upon by parasitoid wasps and mites that feed on eggs under the scale cover. There is a definite reduction in the number of eggs produced when mites are present. Predators include ladybeetles and birds such as chickadees, nuthatches and brown creepers. Search for smooth round holes (parasitoid exit holes), ragged holes (beetle predation) or a white area where the scale have been removed (bird predation) to determine the level of natural enemies and surviving scale.